AMES, Iowa – The 2015 Iowa State Bacon Expo will be held from 11 a.m. to 3 p.m. Oct. 10 in the Jeff and Deb Hansen Agriculture Student Learning Center, south of the Iowa State University campus. Bacon Expo is the only student-run bacon festival in the nation that focuses on education and philanthropy. Any leftover bacon will be donated to Food at First in Ames. This is the third year the group has donated to the food bank. This year’s theme, Bacon Nation, is focused on providing a portion of the profits to the Puppy Jake Foundation and the Wounded Warrior Project. The Puppy Jake Foundation in Des Moines trains service dogs for military veterans at no charge. The Wounded Warrior Project is a nonpartisan group that works to raise awareness and public support to help veterans help each other and also provide services for injured service members. This year’s expo will include live entertainment, educational activities, children’s activities, student performances, bacon-eating contest and a bacon feud game. Ticket holders will be able to sample an unlimited amount of bacon. Treats include traditional bacon strips, chocolate-covered bacon, bacon cupcakes, jalapeño-wrapped bacon and much more. Tickets are available online at www.midwestix.com or at the door. The cost at the door is $15 for adults, $10 for students and children. Children under 5 years old are free. Advanced tickets are $12 for adults, $10 for students and $8 for children under 10 years old. Sponsors for this year’s Bacon Expo include Brenneman Pork, Iowa Pork Producers Association, Iowa Corn, Iowa Select Farms, Tyson and Summit Agricultural Group. The Oct. 10 Iowa State Baco Expo will feature creative bacon treats. 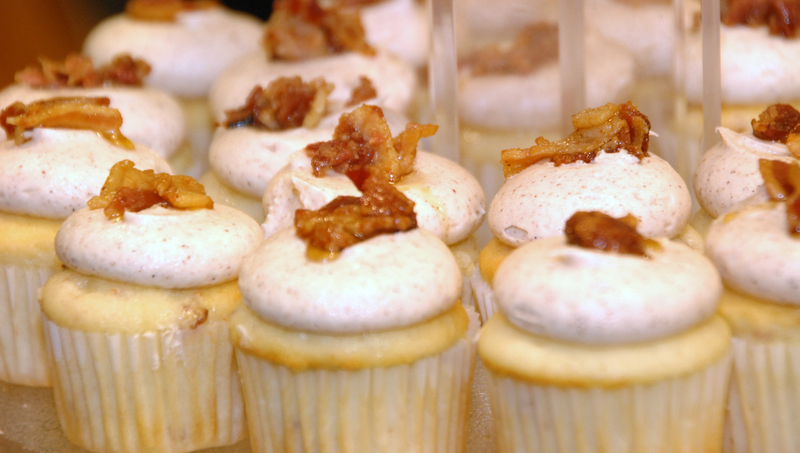 These bacon-topped cupcakes were handed out last year to attendees. A portion of this year's profits will go to the Wounded Warrior Project and the Puppy Jake Foundation.